Utlimate Guide To High Fiber Low Carb Foods - 31 Tasty Options! On a low carb meal plan, it’s easy to load up on high fat foods, but what about those high fiber low carb foods, full of nutrients and digestive aid? Those often get left behind! Not anymore my friends, because these super delicious low carb foods are PERFECT for those counting their net carbs, are full of flavor, and make a GREAT addition to all sorts of low carb recipes! Below I’ll share some of the top high fiber low carb foods, how to incorporate them, and why. Be sure to grab the high fiber low carb foods chart so you can print it and keep it on hand. Are Any of These No Carb Foods? 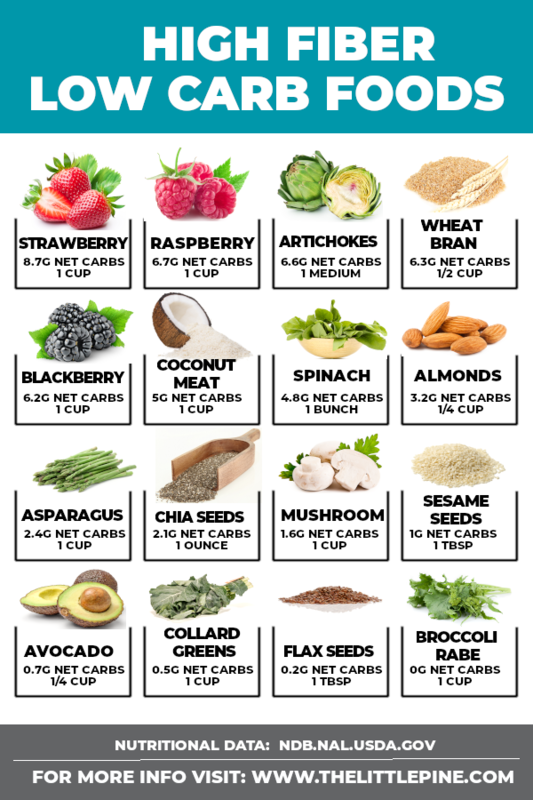 We’ll delve into the nitty gritty on fiber below, but here’s a high fiber low carb foods keto chart to get your started! Net carbs are calculated by subtracting the fiber from the total carbs, whereas total carbs include the fiber. Pst, the high fiber low carb foods chart above can be sorted to accommodate both! Fiber is a carbohydrate found in grains, fruits, vegetables, nut and seeds. Soluble, which dissolves in water to create a gel. Think high fiber low carb foods like psyllium husk and chia seeds. Insoluble Fiber, which adds bulk/roughage — leafy greens, cauliflower, etc. High fiber low carb foods add “bulk” to our stool, which help pass everything through our digestive tract more easily. The absorption of sugar may be slowed down by soluble fiber. For this reason, foods high in soluble fiber are great high fiber low carb foods for diabetics. High fiber foods are an awesome tool for weight management, as they fill you up and keep you satiated. Infact, this study found that by simply increasing fiber intake, patients were able to lose more weight. Examples of carbohydrates can be found in all sorts of foods, from low carb fruits to low carb vegetables to low carb nuts. Even some low carb grains! Adding keto fruits (such as raspberries and strawberries) to a bowl of low carb Greek yogurt. Top it with low carb granola for one of my favorite low carb breakfasts. Make keto granola full of nuts and seeds (that are listed above) for a high fiber low carb cereal. Low carb salads made with spinach or collard greens. Keto vegetables sauté. Mushrooms, broccoli rabe and asparagus are all delicious with some simple olive oil, salt and pepper. Enjoy almonds or unsweetened shredded coconut for tasty low carb snacks (both of these also make for great high fiber low carb foods breakfast). Grains. Barely, whole wheat, etc. Beans. Split peas, lentils, black beans, etc. High carb fruits. Pears, apples, etc. High carb vegetables. Potatoes, etc. Since fiber ir a carbohydrate, there are zero no carb foods on this list of high fiber keto foods. That said, some are pretty close when the net carbs are calculated. Keep in mind, you can always eat LESS of a food to consume less carbs. If you’re new to a low carb meal plan, and trying to gather all the low carb food list printable resources you can, great news: I’ve created a low carb resource library full of assets! As far as macronutrients go, protein is the best suppressor of the hunger hormone in charge of keeping us full and making us hungry again. Check out this list of high protein low carb foods to see what you can squeeze into your meal plan. More often than not, fitting high fat low carb foods is easy for us (hello cheese, red meat and nuts!) But if you’re looking for a full list of ideas, check out my guide. Alright my friends! I hope this post helps sheds some light that getting fiber on a low carb diet is totally possible, and that low carb fiber supplement may not be necessary. Let me know your favorite high fiber low carb foods in the comments below. Enjoy! I made your chocolate syrup, and it is good. However I would like to know how you figured the nutrients. I thought they were off, especially considering the calories in erythriol. I. Came up with 38 calories. And not all cocoa have the fiber that Trader. Joe’s has, making the carbs much more. Hi! Glad you liked the chocolate syrup 🙂 Yes, the nutritional information will vary based on the products you use, so keep that in mind when you calculate your own carbs. Everyone will reduce this syrup differently. I was able to make a batch with 24 Tablespoons, so 1 serving of my batch would equal 2 Tablespoons. Hope this helps! Glad to see this information and this is great stuff. I am really interested in your list of foods.